The European Space Agency (ESA) led Rosetta mission, made history this past year, and, captured the attention of people around the world as it became the first to orbit and land on a comet. The spacecraft achieved its goal after deploying a washing machine-sized lander onto the surface of Comet 67P/Churyumov-Gerasimenko on Nov. 12. The plucky little lander defied odds and survived several bounces across the comet’s surface to deliver its science data before ultimately entering into an indeterminate hibernation period. Rosetta embarked on a ten-year journey across the solar system to rendezvous with Comet 67P/Churyumov-Gerasimenko, in hopes of unlocking the secrets of the early solar system. After launching from French Guiana’s Kourou spaceport atop an Ariane 5 rocket on March 2, 2004, Rosetta reached its first major milestone a decade later, by being the first spacecraft to rendezvous with a comet. The spacecraft is composed of an orbiter –Rosetta—and a lander, Philae. The pair was named for the famed Rosetta stone and obelisk that ultimately enabled us to decipher ancient Egyptian hieroglyphs. Comets are essentially cosmic time capsules, carrying with them primordial components from the beginning of the solar system. Just as the Rosetta stone and Philae obelisk helped unlock the secrets of an ancient language, the Rosetta spacecraft and Philae lander aim to help us understand how our planet and solar system formed. 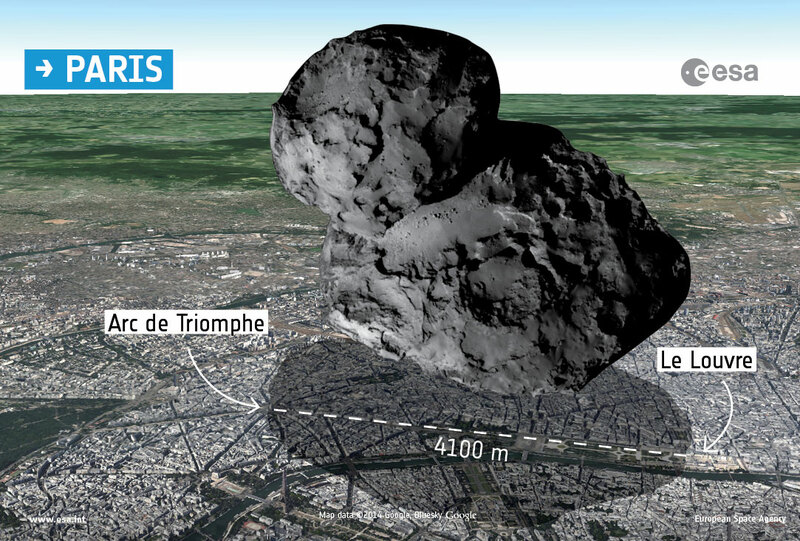 Rosetta’s journey to the comet was not easy; in fact comet 67P was not the original target. The mission was originally set to launch in Jan. 2003 with an intended target of comet 46P/Wirtanen in 2011. This plan had to be revised following a failure in the Ariane 5 rocket during a mission in 2002. 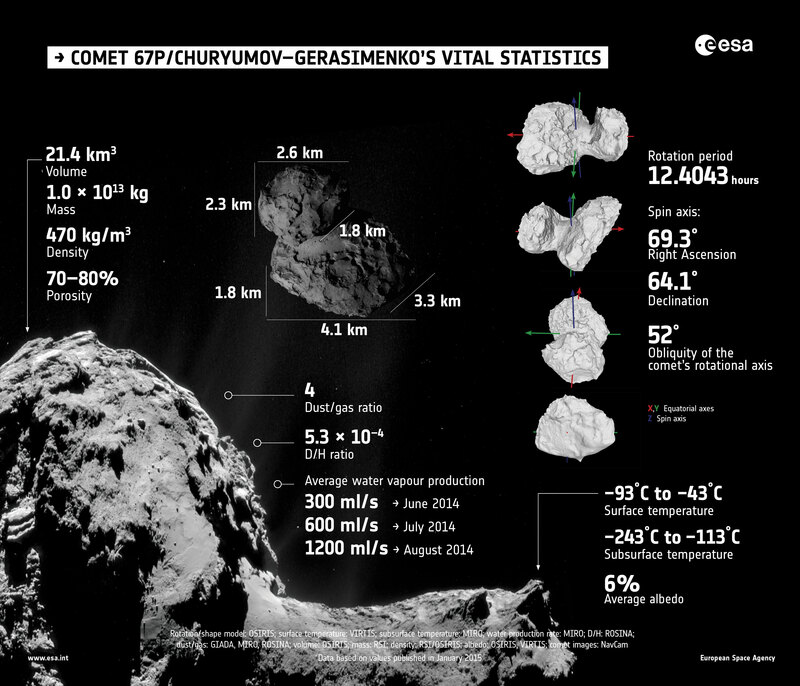 After the issue with the rocket had been resolved, a new target, comet 67P/Churyumov-Gerasimenko, was selected. A new launch date of Feb. 26 was selected with a comet rendezvous to occur in 2014. Finally, after two launch scrubs, Rosetta blasted off into space on March 2, 2004. To achieve the velocity required to rendezvous with 67P, Rosetta would require more than just the boost an Ariane 5 could provide. In order to give her the boost she needed, Rosetta would complete three flybys of Earth and one of Mars. In between planetary flybys, Rosetta also took advantage of the opportunity to flyby and photograph two different asteroids — 2867 Šteins and 21 Lutetia. Following the final flyby or gravity assist from Earth, Rosetta now had the momentum needed to propel itself out to meet comet 67P. In order to save precious systems on board, the Rosetta spacecraft was placed in a 31-month hibernation period. On Jan. 20, 2014, following a very successful social media campaign, people around the world waited on the edge of their seats to “wake-up Rosetta”. At this point in its journey, the craft was far enough from Earth that it took almost 30 minutes for the signal to travel each way. Scientists had a window of time where they hoped to see a spike on their computer monitors; this would signal that Rosetta had successfully come out of hibernation. 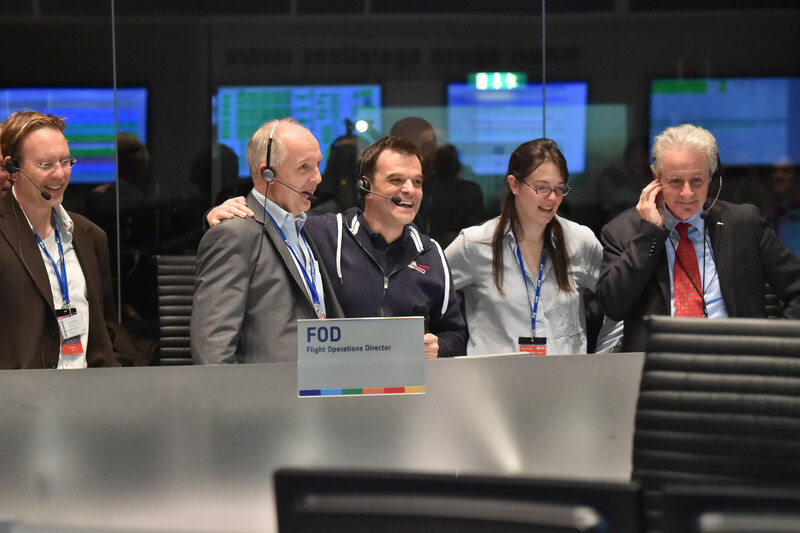 After an agonizing wait, scientists in the operations center at ESA jumped for joy when they saw it. Like a spike on a heart monitor, the on-screen blip announced Rosetta had awoken and was ready to begin her work. Over the next eight months, as Rosetta closed the gap between herself and the comet, scientists began to see the first images of the comet. As the images and data came in, we learned more and more about this enigmatic body. At first, the images we saw were fuzzy, but over time they showed more detail. From the beginning of the mission, based on all the data available, scientists thought comet 67P would be a spherical world; however, in July we found out this was not the case. 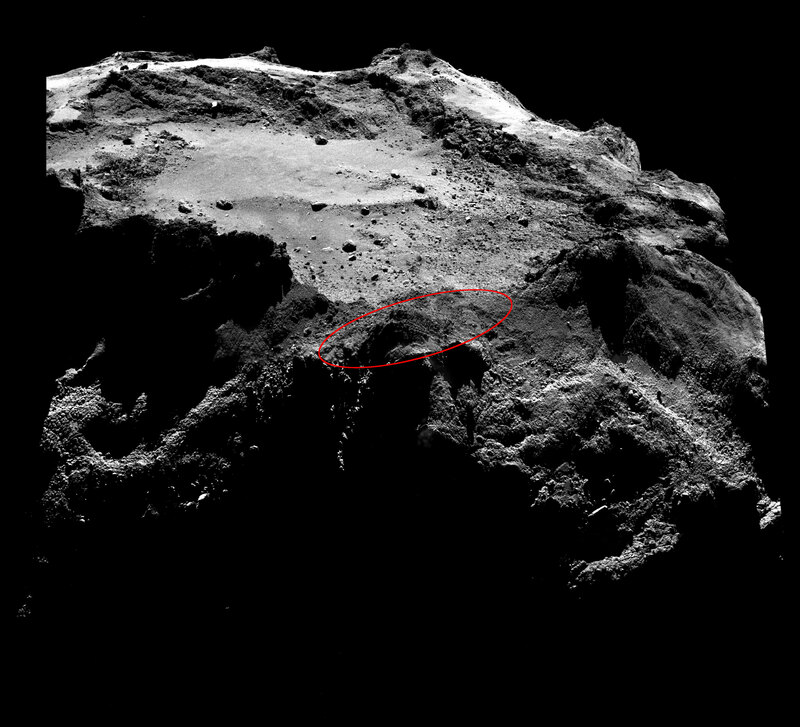 Images coming in from Rosetta showed the comet looked more like a rubber ducky, with two distinct lobes. Scientists began to wonder if this comet was really a contact binary, meaning two separate comets conjoined following a collision. More observations and analysis is needed to completely understand why 67P has this unusual shape. Approximately a month later, Rosetta officially “arrived” at comet 67P and inserted itself into orbit around the comet. 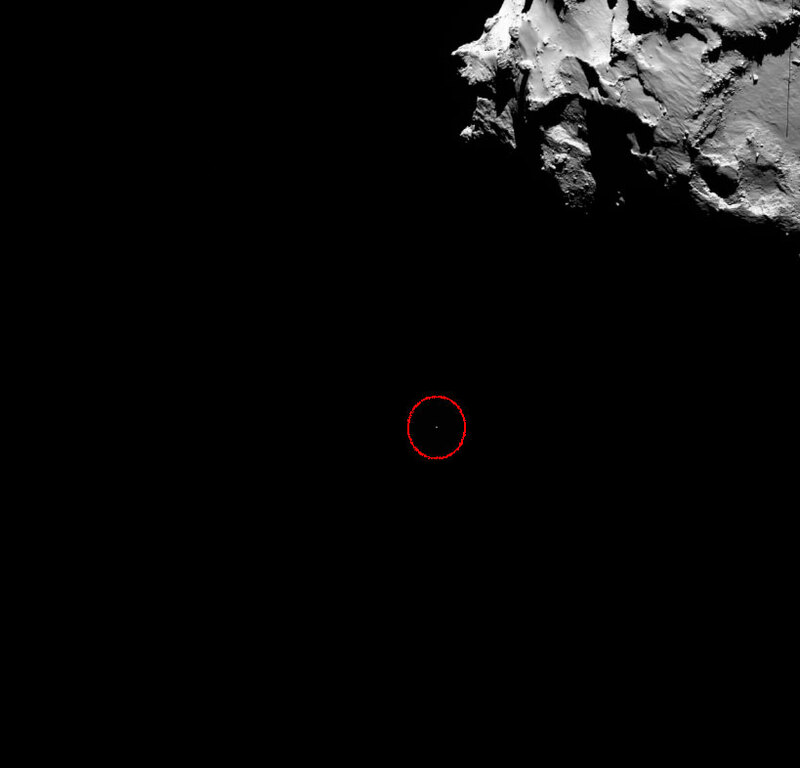 Over the coming weeks Rosetta would be busy observing, mapping, and analyzing the comet’s surface to determine a suitable landing zone. Most missions, like the rover missions to Mars, select the landing zone ahead of time. Since there was not enough information available about this icy body, the landing team had to wait until Rosetta arrived to select the perfect spot for Philae to touchdown. In order to select the best possible site, NASA and ESA scientists had to ask themselves: Will the lander be able to maintain regular communications with Rosetta? How common are surface hazards such as large boulders, deep crevasses or steep slopes? Is there sufficient illumination for scientific operations and enough sunlight to recharge the lander’s batteries beyond its initial 64-hour lifetime without causing overheating? The sites were assigned a letter during an initial pre-selection process, which resulted in 10 potential sites. Further analysis narrowed the field down to five sites. 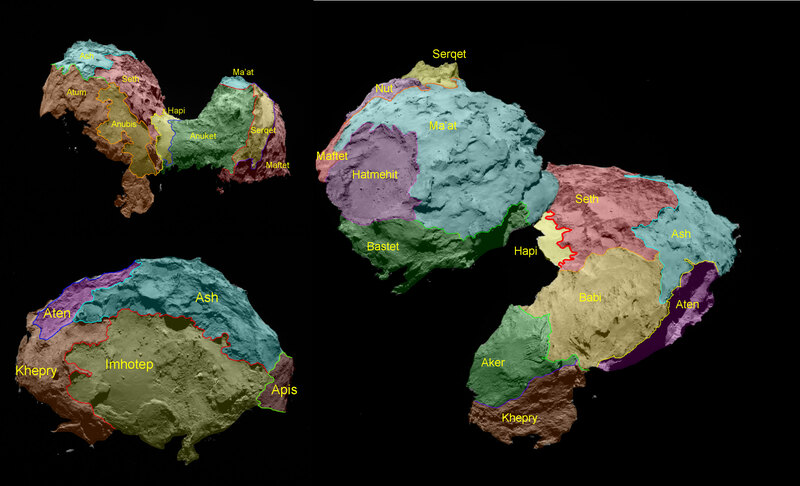 During Rosetta’s approach, it was revealed that comet 67P has two distinct lobes, a smaller (head) one and a larger (body) lobe. Sites B, I, and J are located on the smaller lobe and sites A, and C are located on the larger lobe. “Based on the particular shape and the global topography of Comet 67P/ Churyumov-Gerasimenko, it is probably no surprise that many locations had to be ruled out. The candidate sites that we want to follow up for further analysis are thought to be technically feasible on the basis of a preliminary analysis of flight dynamics and other key issues – for example they all provide at least six hours of daylight per comet rotation and offer some flat terrain. Of course, every site has the potential for unique scientific discoveries,” stated Jean-Pierre Bibring, a lead lander scientist and principal investigator of the CIVA instrument. After arriving at the comet, the ALICE instrument began scanning comet 67P/Churyumov-Gerasimenko’s surface in an effort to determine the origin, composition, and internal processes to gather data that cannot be collected via ground-based or even Earth-orbiting instruments. This new data helped scientists map the surface in great detail and narrow down a landing zone. Scientists were a bit shocked to discover the comet’s surface was not as expected. When viewed in the ultraviolet portion of the spectrum, they observed the surface to be darker than charcoal and void of any large, icy patches. Due to its location and distance from the Sun, any exposed water-ice would not be vaporized by the Sun and would be present on the surface. ALICE also detected the presence of both hydrogen and oxygen in the comet’s coma (atmosphere). The ALICE instrument is packed with over 1,000 times the data-gathering capabilities of the previous generation’s instruments, while weighing under nine pounds (4 kilograms) and drawing only 4 watts of power. ALICE is part of a group of 11 different science instruments aboard Rosetta, all designed to help unlock the secrets of comet 67P. NASA is also contributing to the Microwave Instrument for Rosetta Orbiter (MIRO), the Ion and Electron Sensor (IES), a portion of the Rosetta Plasma Consortium Suite, and the Double Focusing Mass Spectrometer (DFMS) electronics package for the Rosetta Orbiter Spectrometer for Ion Neutral Analysis (ROSINA). On Oct. 18, 2004, ESA gave the green light for Philae to attempt the first-ever soft landing on the surface of a comet. After weeks of scrutinizing images and date from Rosetta, the team selected site J, located on the head of the comet, as the primary landing site. Following a public contest, the site was dubbed Agilkia, in honor of an island located on the Nile river. Agilkia is located close to the site where the Philae obelisk was discovered. At 3:35 a.m. EST (0835 GMT) on Nov. 12, Rosetta released Philae, to start its seven-hour free-fall to the comet’s surface. The landing process is a fully autonomous process, with ESA supplying instructions to the spacecraft and the lander prior to release. It takes 28-minutes for the signal from Rosetta to reach us here on Earth, so ESA expected to receive landing confirmation at 11:00 a.m. EST (1600 GMT). Forty-five years ago, the world waited, glued to their television sets to see a pair of NASA astronauts land on the Moon. Just a month ago, the world waited, this time glued to their computer screens, for the signal telling us the little lander was safe on the surface. Once that signal came in, the team in ESOC knew something was not quite right. Further analysis showed the lander touched down initially, and with none of the three grappling systems working, Rosetta bounced three times across the comet’s surface, finally landing in the shadows. The science team was able to download data from all of Philae’s instruments, and rotate the lander 35 degrees ensuring the largest solar panel would be exposed to sunlight — ultimately giving Philae a chance to collect enough solar energy to power back up in the future. Philae is now in hibernation mode, and the team remains hopeful it will be able to power back up once the comet gets closer to the Sun. 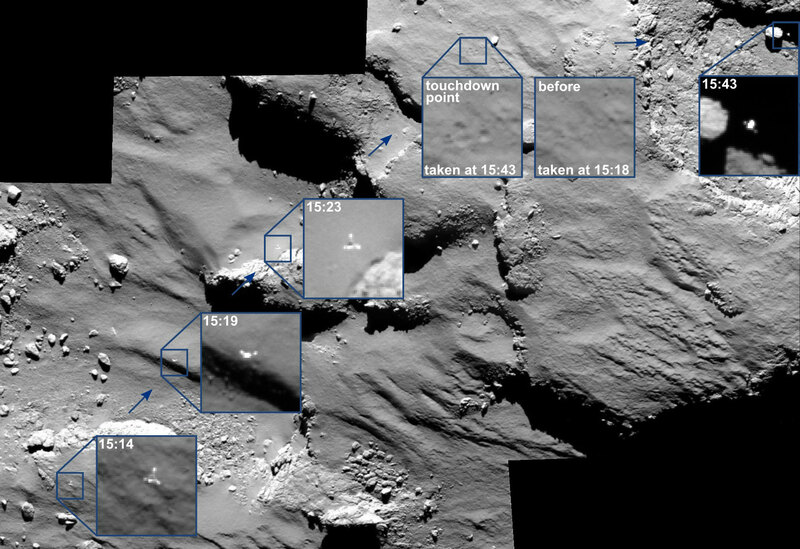 The first images from Philae after touchdown were of the landing site, including panoramic shots of the surrounding area. Philae is equipped with sensors and will measure the density and thermal properties of the surface; use its gas analyzers to detect and identify any complex organic chemicals that might be present; as well as measure the magnetic field and interaction between the comet and solar wind. Philae is also equipped with a drill, able to dig up to 8 inches (20 cm) below the comet’s surface, collecting samples for testing. 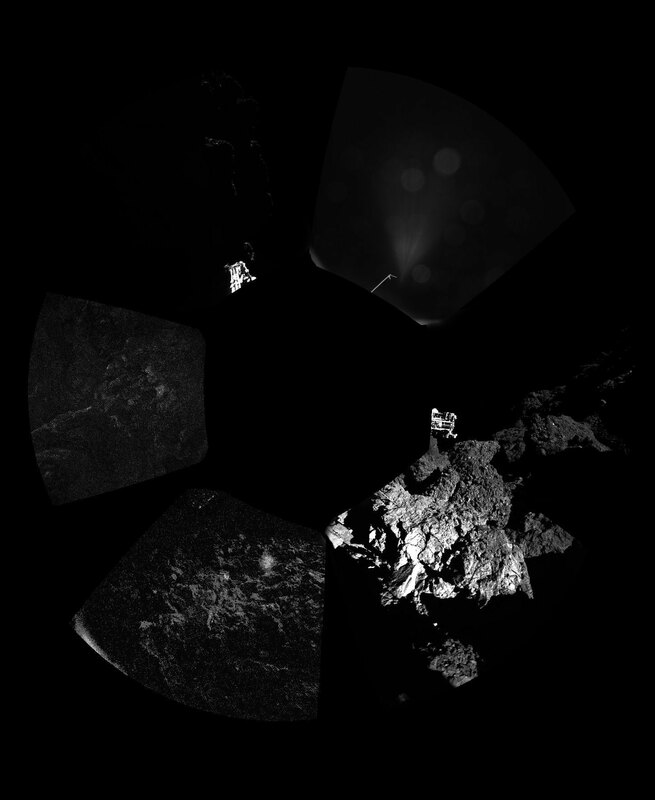 Rosetta’s instruments have been busy studying the comet from different angles, and taking images at different wavelengths. Using the VIRTIS instrument, scientists were able to take the comet’s temperature, determining it is warmer than expected and revealing the surface is actually dark, dusty and porous instead of icy. Throughout history, comets have fascinated us with their unpredictability. Even though we have a better understanding of comets behave, there is still much to discover. Earlier this year, researchers observed a dramatic increase in the comet’s activity, and at that time Rosetta was too far from the comet to determine the cause. 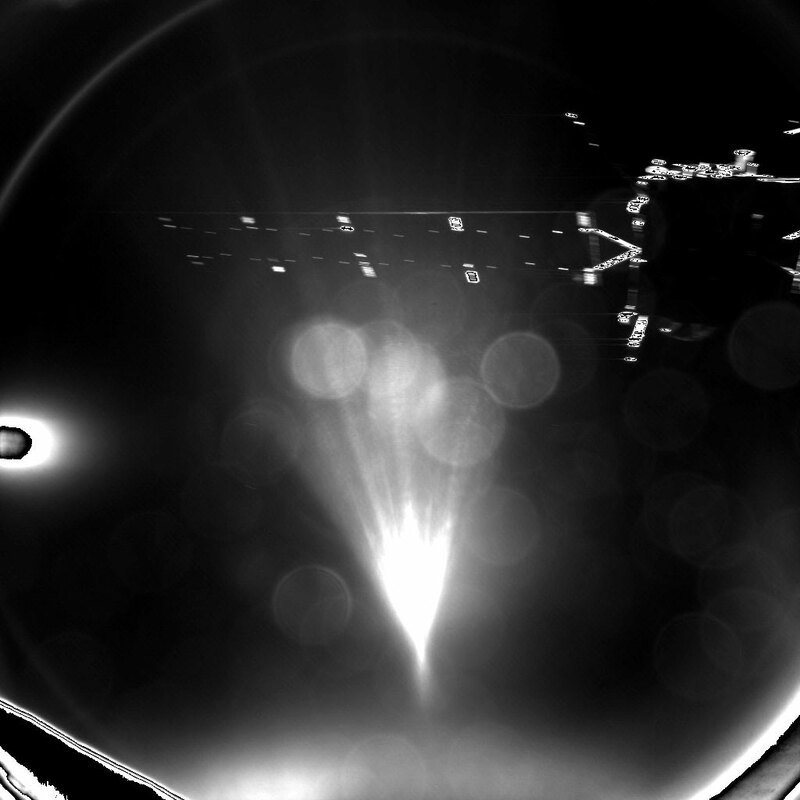 In June, Rosetta’s MIRO instrument started detecting water outgassing from the comet. At the time, Rosetta was located at approximately the same distance as the Earth is from the Moon, from the comet, and MIRO observed 67P ‘sweat’ about 1 cup (300 mL) of water per second – the equivalent of two glasses. Ever since, the activity has rapidly increased, with peaks of 1.3 gallons (5 liters) of water per second seen by MIRO. Rosetta’s ROSINA instrument, also known as the ‘comet sniffer’ detected a variety of molecules in the coma of 67P, including water, carbon monoxide, carbon dioxide, methane, and even a few nitrogen and sulfur varieties. 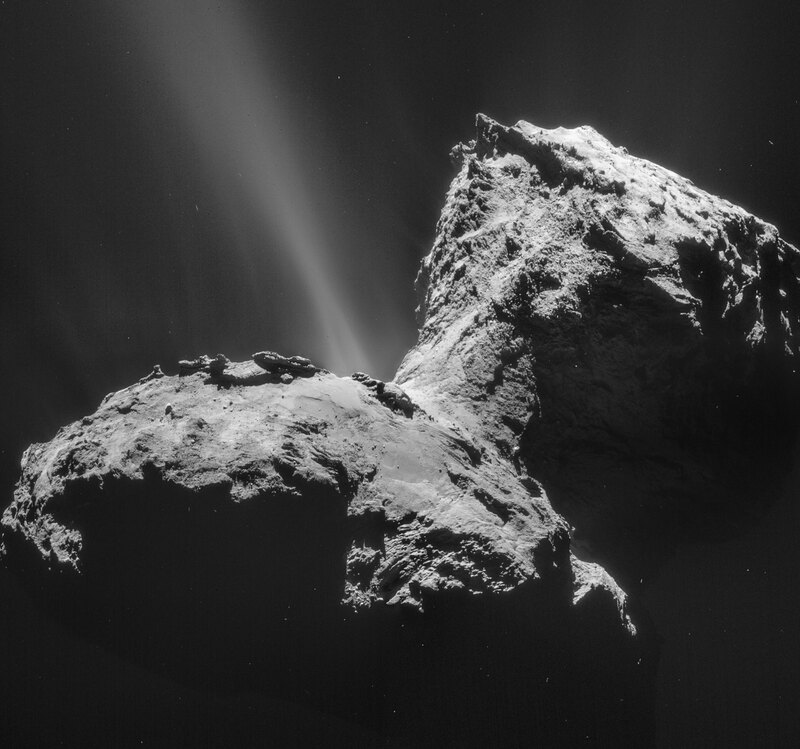 Translation: comet 67P smells like a combination of ammonia, urine, and rotten eggs. VITRIS also detected both water and carbon dioxide in the comet’s coma, backing up ROSINA’s findings. The GIADA instrument, teaming up with COSINA, has been busy collecting dust particles, and measuring their velocities. After careful analysis, COSINA determined that at least one dust grain contains sodium and magnesium. This dust grain sparked the researchers’ curiosity so much, they named it Boris. Now, both sodium and magnesium have been detected in comets before. However, in this case, the minerals were detected in the comet’s inner coma and not the tail region. Another question the Rosetta mission hopes to answer is “Where did Earth’s water come from?” Scientists have long hypothesized that comets were responsible for supplying the infant Earth with water, and ultimately life. Recently, ESA announced that water vapor collected from the comet varies significantly from the water we find on Earth, thus reigniting the debate on where Earth’s water came from. The Earth formed over 4.6 billion years ago, and in its infancy was a much hotter world than we know today. As such, any surface water present would have boiled off by the searing heat of an early Earth. Today, our home planet is very different, with two-thirds of its surface covered by water. So how did that water get here? One hypothesis is that the water was delivered to Earth after the planet significantly cooled, further on in its development. The delivery method was most likely via comet or asteroid collision; however, this hypothesis is strongly debated. How can we tell where water came from? By analyzing the water and determining its “flavor” or composition, researchers can tell the proportion and variety of hydrogen isotope present, thus determining its origin. In the case of comet 67P’s water, Rosetta’s analysis discovered the water contained a ratio of hydrogen to deuterium — a form of hydrogen with an additional neutron – that was three times greater than the water here one Earth. Comets are cosmic time capsules, harboring protoplanetary material left over from the early days of planet formation. These icy bodies form in various regions of the solar system and contain traces of material from where they were forged. However, solar system dynamics does not make comet origins easy to discern. Long-period comets can originate out in far reaches of the solar system in a region known as the Oort Cloud, and typically form in the region around Uranus and Neptune. This area is far enough away from the Sun that water ice would be present. So how do they get to the Oort Cloud? As the outer planets settled into their orbits, gravitational interactions between the planets scattered the comets to the outer solar system. On the other hand, Rosetta’s comet, belonging to the Jupiter-family of comets, is thought to have formed way out, beyond Neptune, in a region known as the Kuiper Belt. From time to time, the orbits of these comets are disturbed and as they travel through the solar system, they are captured by Jupiter’s massive gravitational pull. Scientists have measured the ratio of deuterium to hydrogen (D/H) in 11 different comets, thought to originate in different regions of the solar system, only the Jupiter-family of comets, like Comet 103P/Hartley 2, was observed to contain the same D/H ratio as the Earth’s oceans. Meteorites within the main asteroid belt between Mars and Jupiter were also studied and determined to be a match to Earth’s oceans. Asteroids and meteorites tend to have significantly lower water content than comets, but could still contribute to the presence of water on Earth. 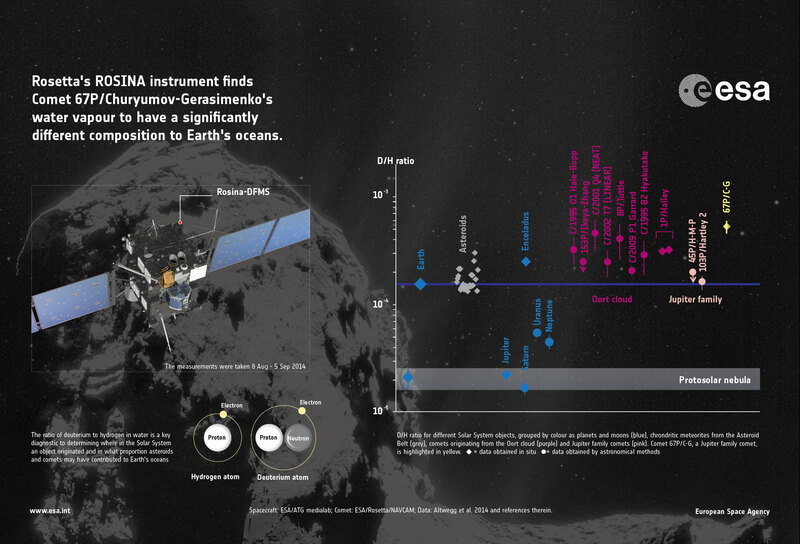 Rosetta’s instrument Rosetta Orbiter Spectrometer for Ion and Neutral Analysis, or ROSINA, determined the D/H ratio of comet 67P is three times higher than that of Earth’s oceans, higher than the Jupiter-family comets, and higher than any Oort cloud comet. “Our finding also rules out the idea that Jupiter-family comets contain solely Earth ocean-like water, and adds weight to models that place more emphasis on asteroids as the main delivery mechanism for Earth’s oceans,” Atlwegg said. Over the coming months, Rosetta will continue to follow along with comet 67P, taking measurements and beaming data back to us on Earth. The operations team will continue to monitor how the comet evolves and behaves as it approaches the Sun.